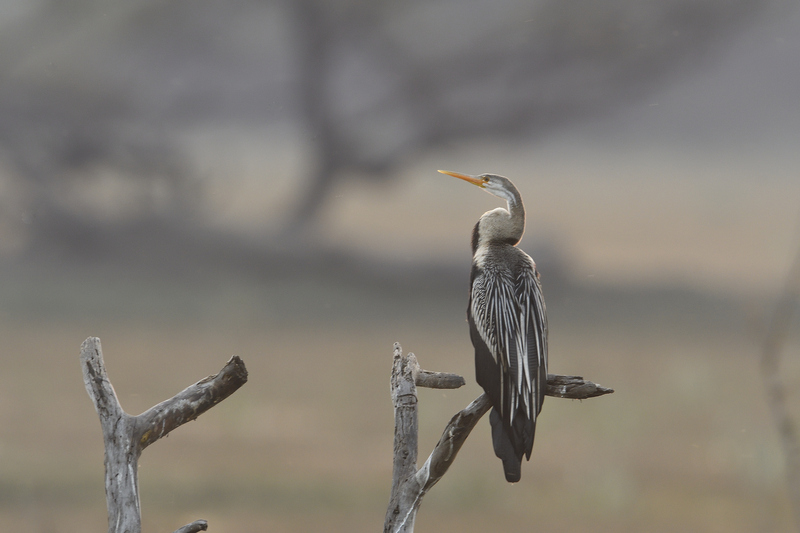 Bharatpur is a magical place that has always given me some great photo opportunites. So, when my friend Saravanan told me that he was going to be there with Amar (Ghattargi) & Anil (Nadgeri) in the company of Chotu Khan, it was a great chance to make a quick weekend dash (subject to getting the requisite permissions at home, of course). I left home at 8am last Saturday and made the 240km drive to the Keoladeo National Park in less than 3-and-a-half hours, beating the morning traffic in Delhi and zooming through the Noida Expressway. We finished spending a few hours in the sanctuary and the plan was to meet up at the sunset point at 5:45pm to try and get some opportunity for silhouettes in the sunset. However, the sunset point was just teeming with everyone in the world and we found a place a bit further down the area between two shrubs on the side. We spotted an Oriental Darter on a nice perch and it just seemed perfectly positioned for a rim-lit image. The sun was setting behind the subject (and just off the frame that you see) – this is what is called backlighting. The rays of the sun bouncing of the feathers on the outline of the bird would create a glowing effect on the edges of the subject while the rest of the subject would be dark. In order to achieve that effect, one would have to under-expose the image adequately – I started with a -2 stop underexposure which I thought would be ideal in these conditions. And I bumped up the white balance to 9000K to get a nice, warm feel to the image. The Darter turned out to be an obliging subject. As the sun was going down, for a brief moment, the rays were bouncing off the feathers perfectly and created a nice rim-lit outline. This was just the setting that I wanted. At the same moment, the bird paused its preening and gave us a perfect profile. More than made the 240km dash from home worth it, wouldn’t you agree?